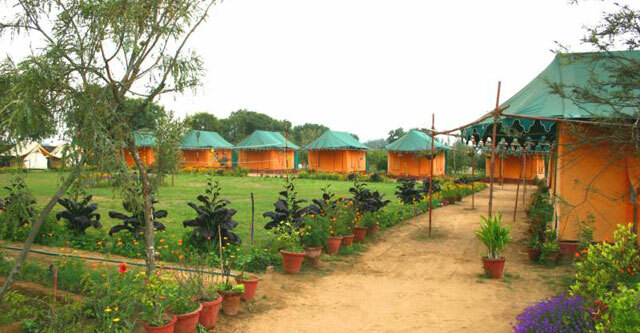 We bring to you a new camping experience, set in the peaceful and quite settings of Wazirpur Village.. The Resort has an Adventure concept which is reflected in accommodation provided and the various activities that are undertaken at the Resort. Being at a close proximity to Gurgaon, the location of the resort is ideal for Corporates who would like to organize their Conferences, meetings and offsites here. It is also ideal for Educational tour. not only do the students get an opportunity to have a lot of fun and folic but they also learn valuable aspects of an Indian village life. The numerious Adventure activities avialble at the resort only add to this unique learning experience. It is also an ideal getaway for tourists looking for a quiet place to stay near Delhi Airport, which is just 30 kms from our resort. We provide free pick up and drop facility to and from the Domestic and International airport. At A Village Retreat you have a unique opportunity to stay in luxurious Swiss Cottage Tents and at the same time enjoy the peaceful ambience of a Indian Village. The resort offers 10 Swiss Cottage Tents with attached western toilets with provision of hot water, spread across lush green lawnin a quiet ambience to ensure that you have a relaxed and rejuvenating holiday. A Village Retreat has developed a unique collection of activities and games that are geared toward groups, whether you are here for a retreat, conference, reunion, team building or school outing. “Team Bonding” is what we offer along with lots of Fun … ! Team building games are a fun way to develop cehesiveness. They tear down walls in communications, provide avenues that encourage discussion, and increase productivity. Here are some games and exercises to do with your squad to build a unified group. 1. There is less resistance because it is FUN. 2. Authentic behavior is easier to witness in people as they have to quickly react to situations without thinking. 3. It is easier to create memorable moments that mimic work. 4. You create bonds with the people you are with that a typical workshop cannot possibly replicate. Two teams of relatively equal weight are chosen. They are required to position themselves along the rope on either side of one of the lines leaving the center area empty. The referee holds onto the rope at the point of the flag as the rope is gradually made taught. He makes certain the flag is positioned precisely mid-way between the two lines. On his own command, he releases the rope and shouts, "Go!". Both teams then pull on their end of the rope. The object is to pull the flag over the team's goal line. A trust fall is a purported trust-building activity conducted as a group exercise in which a person deliberately allows himself to fall backward, while standing on an elevated position, relying on the other members of the group to catch him. A three-legged race is a game of cooperation between partners as much as it is one of speed. It involves two participants attempting to complete a short sprint with the left leg of one runner strapped to the right leg of another runner. The object is for the partners to run together without falling over, and beat the other contestants to the finish line. Its also a game of cooperation between partners, where one partner walk on the bricks without touching his feet on the ground and the other partner shifts the brick towards the finish line. The partners compete with other contestants and whoever reaches the finish line, first is the winner. The game starts with any number of players and a number of chairs one fewer than the number of players; the chairs are arranged in a circle facing outward, with the people standing in a circle just outside of that. A non-playing individual plays recorded music. While the music is playing, the players in the circle walk in unison around the chairs and the moment music stops everyone must race to sit down in one of the chairs. The player who is left without a chair is eliminated and one chair is also removed. The music resumes and the cycle repeats until there is only one player left in the game, who is the winner. Tent pitching race is a fun activity, which involves collecting the material required for pitching a tent & then setting up the tent. The person/ team who sets the tent the fastest gets awarded. We also offer Village activities like Pottery Making, Camel ride, Tractor ride and village hikes. These activities give you an insight of the village life and at the same time its fun to indulge in these activities. Participants are given a chance to try a potentially challenging obstacle with the support and encouragement of the group. Participants set their own personal challenge as they move from obstacle to obstacle. Each task brings new challenges, thrills and fun. While this is an intense experience, participants are closely supervised by trained facilitators and must wear appropriate safety equipment provided to them. Burma Bridge: Burma Bridge is a three-rope arrangement on the obstacle course that bridges two ground structures. Its almost 7 feet above the ground. There is one large rope for your feet and two smaller ropes on either side as hand-holds. The smaller ropes, positioned hip-high, are knotted at intervals to the larger base rope. Rope Ladder: Participants begin the high course three feet on the ground and end up fifteen feet in the air by climbing a swinging ladder made of timbers and cable. The steps of the ladder are three feet apart at the bottom and get progressively farther apart. Double Rope bridge/ Monkey crawling: This obstacle is conquered by walking on one cable and holding another at approximately chest height. Monkey crawling can also be combined on this obstacle. Hold on to the top rope with legs crossed onto the rope and crawl from one end to another. Balance Beam (Zig Zag): Participants are required to walk across a zig zag beam, which rises in height from 1 ft to 3 ft.
Clean Jump : Participants are required to jump over 02-04 ft adjustable bar. Pit Jump : Approximately 05-07 paces after the clean jump, the applicant is required to jump over a gully at ground level that is 6 ft wide. Commando Crawling : Wriggle on the ground, under the net and cross over from one end to another. Mogli Walk : It is very similar to the Double rope bridge, except the cable to hold is above the head and ropes hang down in order to balance. Commando net : Participants are required to climb up the 10 feet net, go on the other side of the net and climb down from there. High Balance Beam : A standard balance beam...except it's 10 feet off the ground! The participants are anchored by a rope (for safety measure) and they are suppose to walk on the narrow beam, from one end to another. Tarzan Swing : A rope is tied on an overhanging pole structure with a mud pit below. The participant has to cross the pit from one end to another while clinging onto the rope. Climb the wall for that sense of adventure and to test one’s physical limits.... ! Participants receive a safety briefing and are fitted with harnesses prior to the 28-foot climb. As you prepare, you are harnessed to a belay (safety) system. If at any time during the climb you lose your strength, simply push away from the wall and the belay gently lowers you safely back to the ground. This is an individual activity designed to build confidence. Controlled vertical descent using ropes, harnesses and friction devices. Resort provides Conference facility in the heart of a Village with rural settings. The conference hall is fully air conditioned and is equipped with all basic conferencing facility like LCD projector & screen, White board etc. For small groups you can opt for 'U' shape sitting arrangement which can accommodate approx. 50 persons and for bigger assembly, theatre style sitting arrangement will be perfect which can accommodate upto 80 persons. We provide a unique setting, along with essential facilities for conducting group seminars, meetings, and other business activities. After reaching Rajiv Chowk, drive further on the highway for 6 kms to reach the Toll near Hero Honda Chowk. Turn left from the chowk and drive 2 km. Turn left on Pataudi highway road, drive for another 9 kms towards Wazirpur to reach Dew Park Restaurant . Turn left from Dew Park Restaurant and drive through the narrow lane for 2 km to reach the Village Retreat. We have placed signboards at all turns after you take left from Dew Park Restaurant. Inclusions : Brunch (1200-1430 hrs, Veg), Evening Tea/ Coffee + Snacks, Obstacle Park, Sports Equipments(Volleyball+Badminton+Table Tennis+Cricket). Includes : Lime Juice, Brunch, Evening Tea, with sandwiches, Obstacle Course. Includes : Welcome Drink and light snacks on arrival. Lunch, In-house Music, Adventure Activities (12 Obstacle Activities), Pottery Making, Team Building Activities, Use of in-house games like cricket, badminton. Day Activity at A Village Retreat (minium 30 pax): 09:00 - Arrive & Check-In at A Village Retreat, 09:15 - 09:45 Welcome Drinks with Snacks, 10:00 Team Building Activites/ Conference, 13:00 - 14:30 Lunch, 14:30 - 15:30 Proceed for remaining activities, 16:00 Break with snacks and in house music, 17:30 Deaprture.